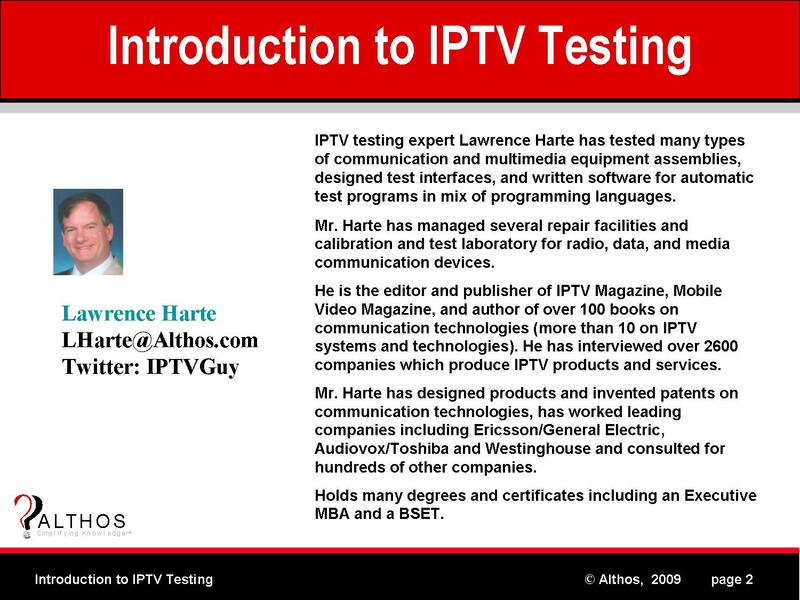 IPTV testing expert Lawrence Harte has tested many types of communication and multimedia equipment assemblies, designed test interfaces, and written software for automatic test programs in mix of programming languages. Mr. Harte has managed several repair facilities and calibration and test laboratory for radio, data, and media communication devices. He is the editor and publisher of IPTV Magazine, Mobile Video Magazine, and author of over 100 books on communication technologies (more than 10 on IPTV systems and technologies). He has interviewed over 2600 companies which produce IPTV products and services. Mr. Harte has designed products and invented patents on communication technologies, has worked leading companies including Ericsson/General Electric, Audiovox/Toshiba and Westinghouse and consulted for hundreds of other companies. This book explains how to monitor, test, and diagnose IPTV systems and services. Covered are the quantitative (packet loss, error rate) and qualitative (perceptual) quality measurement and control processes. Discover how quality of experience (QoE) can be very different than traditional quality of service (QoS) measurements.